Manchester City have been drawn against Hamburg in the Uefa Cup quarter-finals. If City overcome the German side, who are managed by former Tottenham manager Martin Jol, they will face Werder Bremen or Udinese in the semi-finals. 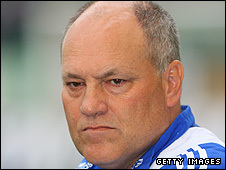 Jol has already beaten one English side in this year's competition when Hamburg saw off Aston Villa in the group stage. Paris St Germain play Dynamo Kiev and Shakhtar Donetsk face Marseille in the other ties, with the first legs on 9 April and the return on 16 April. City have two former Hamburg players in their squad, with manager Mark Hughes signing Vincent Kompany from the Bundesliga outfit in August 2008 and swooping for Nigel de Jong in January. Hughes said: "At this stage of the competition, it's always going to be difficult because there are no weak teams in the last eight. "I think this is the plum tie to come out of the draw. "There's the connection with Hamburg with us having Vincent and Nigel here, and we played them in pre-season which should help our preparations. "We are a very different side from then to now, and we can look forward to this with confidence." City, who will travel to Germany for the first leg, booked their place in the quarter-finals for the first time since 1979 with a 4-3 win on penalties over Danish side Aalborg on Thursday. Hamburg were also involved in a dramatic tie, which saw them come back from 2-0 down to beat Galatasaray 3-2 in Istanbul. Probably the toughest draw City could have got but being away first is a big advantage. You got any excuses tonight, Roy? Jol expects a tough test against City, adding: "Manchester City are a team that for me are among the best six in England. "They are very strong in every area of the team. I am therefore convinced that we will see two good games. Our goal is the semi-finals." Udinese, the only Italian side left in European competition this season, knocked out holders Zenit St Petersburg 2-1 on aggregate. Marseille, Kiev, Bremen and Donetsk entered the Uefa Cup after they were knocked out of the Champions League group stages, having finished third in their respective groups. The semi-finals take place on 30 April and 7 May and the final will be played at Fenerbahce's Sukru Saracoglu Stadium in Istanbul on Wednesday 20 May. None of the eight teams in Friday's draw have won the Uefa Cup before, with the competition set to become the Europa League next season. City qualified for this year's competition through the Uefa Cup Fair Play system. The first legs will be played on 9 April with the returns on 16 April. The first legs will be played on April 30 with the returns on May 7.